Enthusiasm for sustainable investing is surging. 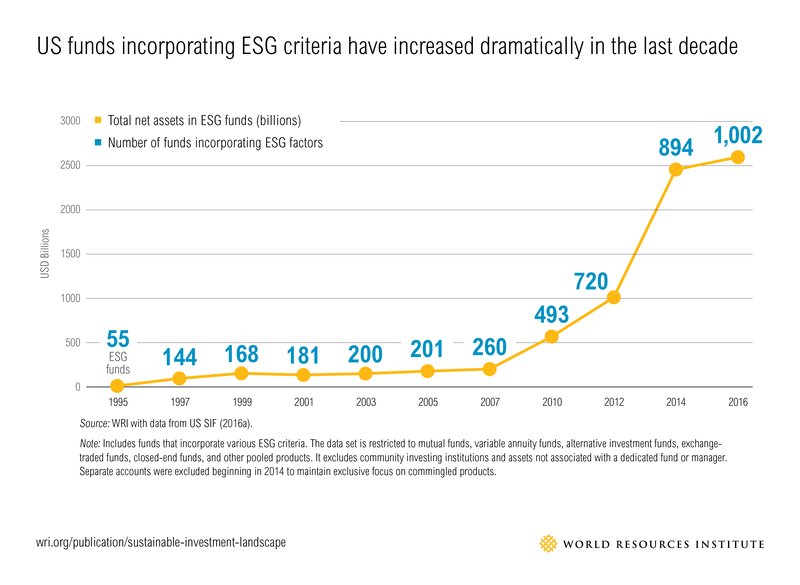 Already, more than $8.7 trillion of investment capital is managed using environmental, social and governance (ESG) factors in U.S. markets alone, according to the U.S. SIF Foundation. That's a 184 percent increase since 2010. This pot of money increasingly includes investments in green infrastructure, renewable energy, affordable housing and more, as well as investments that more holistically integrate broad ESG factors. However, amidst this hype, a certain amount of confusion, doubt and outright skepticism endures. In producing WRI’s new paper, Navigating the Sustainable Investment Landscape, we interviewed 115 investment professionals – including asset owners with $1.26 trillion under management – and found that the prospects for sustainable investing are strong and overcoming key roadblocks will help the market reach a tipping point. Myth 1: Sustainable investing sacrifices returns. One of the most frequent arguments against sustainable investing is that it won’t yield as much money as investing in fossil fuel assets, high-carbon companies or weapons manufacturers. Critics say it limits the investment universe, curbing potential returns from the highest-performing assets. But the data tells a different story. When evaluated across multiple funds and time periods, sustainable investing exhibits a largely neutral – and oftentimes positive – impact on financial performance. A recent Morgan Stanley study of more than 10,000 mutual funds found that sustainable equity funds usually had equal or higher median returns and equal or lower volatility than traditional funds. Oxford University and Arabesque Partners analyzed 41 studies and found a positive relationship between sustainability and financial performance of stock prices for 80 percent of studies reviewed. Many asset managers, like Aperio Group, Generation Investment Management* and Brown Advisory Sustainable Growth Fund, are already achieving outsized returns through sustainable investments. These investors are integrating sustainability data—such as carbon emissions, energy efficiency, executive compensation and board diversity–into fundamental analyses as a means of revealing unseen risks and opportunities. Some managers like Impax Asset Management even focus on placing capital with companies that are creating the technical and business solutions to environmental and social challenges. Investing in these solutions can be riskier over the short-term, but these managers have conviction they will achieve outsized returns over the long-term by bringing some of the early capital into companies creating the transition to a sustainable economy. Myth 2: Sustainable investing violates fiduciary duty. Skeptics of sustainable investing also commonly claim that it violates “fiduciary duty,” or the investor’s legal responsibility to make investment decisions in the best interest of the beneficiary. This duty is often interpreted as a requirement to maximize investment returns above all else. In reality, identifying material ESG factors is important to fulfilling “fiduciary duty.” For example, robust corporate sustainability practices—including those that improve energy use or reduce waste—are material because they can lower the cost of capital for companies and improve operational performance. Considering the sustainability performance of investment opportunities is often explicitly in the best interest of investors, and therefore fully in line with fiduciary duty. The U.S. Department of Labor (DOL), the agency overseeing most U.S. pension funds, states this explicitly. In a 2015 bulletin, the DOL provided clarity for fiduciaries managing investments under the Employee Retirement Income Act, affirming that when ESG is core to value, sustainable investing does not breach fiduciary duty. Indeed, as the policy landscape continues to evolve, such as through new carbon pollution standards and minimum wage increases, many legal scholars contend that overlooking ESG risks may actually violate fiduciary duty. Myth 3: Sustainable investing is risky in uncertain markets. Some skeptics point to uncertainty in the markets as another reason to steer clear of sustainable investing. Some see the 2010-2011 collapse of the clean tech bubble as evidence that sustainable innovation is categorically risky. There’s still doubt about whether policies will create the necessary incentives to ignite a transition to a low-carbon economy. Certainly we’ve experienced short-term difficulties in clean tech markets. The bankruptcy of the once-promising SunEdison is a prime example. But there are stark differences between today’s markets and those during the clean tech bubble. Fundamentals have shifted. Consider the bankruptcy of Peabody, the largest private-sector coal company in the world, as well as dozens of other U.S. coal companies. It clearly doesn’t pay to maintain investments in old industries as technologies shift. In fact, the clean energy market as a whole is experiencing a surge. Installed capacity of wind and solar have grown annually by 23 percent and 50 percent, respectively, over the last decade. At the same time, prices of lithium-ion batteries are dropping precipitously, greatly reducing cost barriers to an electric vehicle revolution. This is a clear indication of a market in transition. Further, the continued rollout of supportive policies and structural changes to the economy is undeniable. Technology and economics are playing the biggest roles in transforming the marketplace. While the Trump administration seems likely to undo policies that promote sustainability, this will not stop the global momentum behind this movement. As the Paris Agreement on climate change takes force, countries of the world are implementing their national climate plans and moving toward a low-carbon growth path. Canada just announced plans for a national tax on carbon pollution, beginning in 2018. Meanwhile, the private sector—driven as much by the business case as policy—is already taking steps to reduce its climate impact. As one indication, 200 companies have committed to set Science Based Targets for their carbon emissions in order to limit global warming to 2 degrees C (3.6 degrees F), and 640 companies and investors have committed to climate action through the We Mean Business coalition. To ignore these signals of a changing economy is the real investment risk. Myth 4: Sustainable investing is unfeasible. Even among investors who recognize the value of sustainable investing, many falter when asked to act. The implementation process can be complex. While sustainable investing does indeed requite some extra work, it is by no means out of reach for the average investor. Consultants, managers and associations are increasingly able to guide asset owners through the technical processes. A number of leading non-profit networks like Ceres, The Forum for Sustainable and Responsible Investment and the UN-supported Principles for Responsible Investment provide a wealth of resources. WRI’s own Sustainable Investing Initiative offers fact-based research, guidance and educational forums. Investors can also take several simple steps to set things in motion. A good starting point is establishing a Board committee focused on education and strategic planning. This can help build common understanding so investors can come to a unified plan of action. At that point, they can turn to the growing set of investment opportunities available through various platforms, including from mainstream asset managers. When making the initial capital move, investors may find it easier to start with a smaller, highly liquid investment in a sustainable fund. They can draw upon this learning experience to inform and refine the broader portfolio approach before moving into more illiquid asset classes like hedge funds, real assets or private equity, which have the most restrictive rules for getting capital. As the world faces unprecedented challenges, the investment ecosystem is swiftly adapting. We’ve seen a deluge of new data, reporting standards, investment services and products that enable investors to engage in practical strategies for sustainable investing. As more investors see past the lingering myths described here and begin to make sustainability a fundamental part of decision-making, they will reap the benefits from a transforming economy. The truth about sustainable investing is that it’s a step in the right direction for long-term profits—as well as for the planet and its people. * WRI is an independent research organization and does not endorse or recommend any specific investment funds, including Generation Investment which is run by David Blood, a WRI Board member.